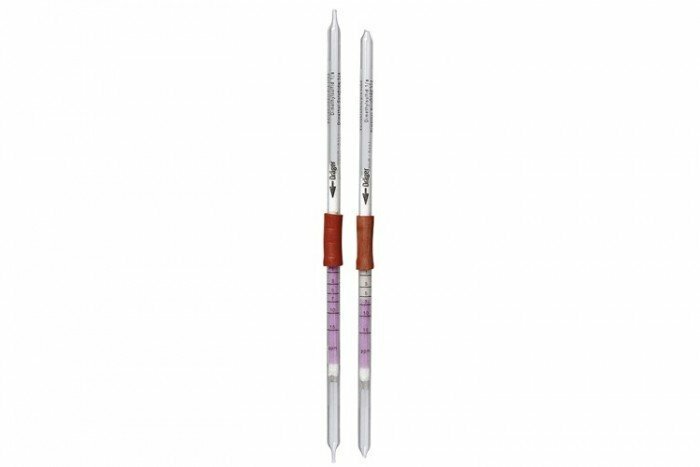 Short Term Detection Tubes, Dimethyl Sulphide 1/a(5) (Measurement range: 0.1 to 10 ppm): Detects a range of substances incl. Acrolein, Allypropyl Disulphide, Diethyl Sulphide , Dimethyl Sulphide , Methyl Ethyl Sulphide. Note: This product has a shelf life of 2 years and comes in a pack of 5 tubes. Many organic compounds with C=C double bonds are indicated as well, but with different sensitivities. It is impossible to differentiate between them. H2S (hydrogen sulfide) is indicated with approximately twice the sensitivity. The tube H2S 5/b can be used as a filtering tube. Then, with n = 20 pump strokes approx. 30 ppm H2S is retained. Methyl mercaptan is indicated with approximately twice the sensitivity.